Hello there pluggy people! We've expanded our little shop into a Big Shop, and we're having a giveaway to celebrate. Oooh, what are you giving away, Lovely Plugly? 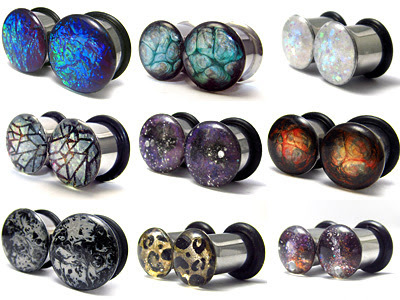 We're giving away ONE pair of plugs to ONE lucky winner. Any size from 3mm - 20mm, all 316L surgical steel designs with the exception of Custom Artwork Plugs. Sounds ace. How do I enter? for a maximum of 7 entries. You MUST post your entry in the Rafflecopter widget below, otherwise your tweeting and reblogging and liking won't count. Tweets and reblogs done with accounts solely used for giveaways will not be counted.